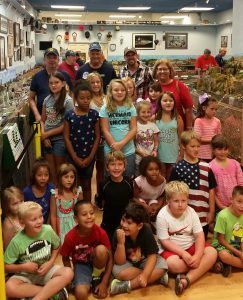 The Grand Strand Model Railroaders welcomed “Gymnastic and More” from Little River to the club Wednesday, August 2, 2017 for an outing. The girls and boys had a great time learning about the layouts, trains, and operating the trains. Some of the group took on the scavenger hunt sheet, looking for the different items on the layouts.